Peptide (C)SKSEEETSPLVTH, corresponding to amino acid residues 500-512 of mouse SLC1A4 (Accession O35874). Intracellular, C-terminus. Homology Rat – identical; human – 12/13 amino acid residues identical. 1,2. Anti-ASCT1 (SLC1A4) Antibody (#ANT-081), (1:200). 3,4. Anti-ASCT1 (SLC1A4) Antibody, preincubated with the control peptide antigen. Immunohistochemical staining of perfusion-fixed frozen rat brain sections with Anti-ASCT1 (SLC1A4) Antibody (#ANT-081), (1:300), followed by goat-anti-rabbit-AlexaFluor-488. 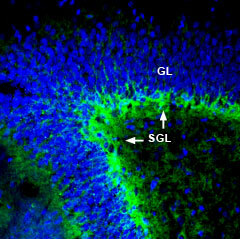 ASCT1 staining (green) is detected in the sub-granular layer (SGL, arrows) of the dentate gyrus. GL = granule layer. Cell nuclei are stained with DAPI (blue). Scopelliti, A.J. et al. (2013) J. Biol. Chem. 288, 8250. Damseh, N. et al. (2015) J. Med. Genet. 52, 541. Glutamate transporters play important roles in the termination of excitatory neurotransmission and in providing cells throughout the body with glutamate for metabolic purposes. SLC1A4 belongs to the SLC1 protein family which contains a range of human and prokaryotic glutamate and aspartate transporters such as the human glutamate transporters (otherwise known as excitatory amino acid transporters or EAATs). SLC1A4 is detected in the brain, skeletal muscle, and pancreas. It is largely selective for alanine, serine, and cysteine but can also transport threonine, asparagine, and to a lesser extent, proline. In the brain, SLC1A4 is preferentially expressed in glial cells and has been suggested to be responsible for the release of L-serine from intracellular stores, in exchange for other extracellular substrates. SLC1A4 exhibits pH-dependent substrate selectivity. Acidic amino acids become substrates at pH 5.5, which may be physiologically important in the acidic environment of the digestive tract where SLC1A4 is involved in nutrient uptake. Despite the high degree of sequence identity, ASCTs function quite differently from the EAATs. The EAATs transport the acidic amino acids glutamate and aspartate against a concentration gradient generating a net movement of substrate and charge across the membrane. In contrast, SLC1A4 exchanges small, neutral amino acids in an electroneutral fashion without generating net movement of substrate1. Recent studies have shown that mutations in the SCL1A4 gene, which are common in Ashkenazi Jews, are associated with global developmental delay, microcephaly and hypomyelination2. Immuno-colocalization of GluN1 and ASCT1 in mouse hippocampus.Immunohistochemical staining of immersion-fixed, free floating rat brain frozen sections using Guinea pig Anti-NMDAR1 (GluN1) (extracellular) Antibody (#AGP-046), (1:600) and rabbit Anti-ASCT1 (SLC1A4) Antibody (#ANT-081), (1:300). 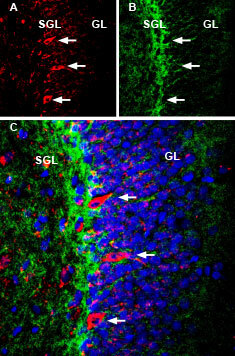 A. GluN1 (red) appears in profiles of hippocampal dentate gyrus interneurons (arrows). B. ASCT1 (green) appears in the extracelullar matrix of the subgranular layer (SGL). C. Merge of the two images demonstrates adjacent localization in several neurons (arrows). Cell nuclei are stained with DAPI (blue).GL = granule layer. Anti-ASCT1 (SLC1A4) Antibody (#ANT-081) is a highly selective antibody directed against an epitope of the mouse protein. The antibody can be used in western blot analysis. It has been designed to recognize SLC1A4 from human, mouse, and rat samples.